Canon dSLR users finally have their own Speedlite oriented ‘strobist’ book to read thanks to the Speedliter’s Handbook: Learning to Craft Light with Canon Speedlites by Syl Arena, which was just recently released at the very end of December 2010. Joe McNally wrote and published The Hot Shoe Diaries: Big Light From Small Flashes back in 2009, and while it is a very good read, it was Nikon-centric (McNally is a Nikon shooter). Authored by Syl Arena (http://speedliting.com), the Speedliter’s Handbook is a nearly 400 page guide on Canon Speedlite flash units (with some coverage of studio strobes) and how to use one or many Speedlites to achieve great photos. The book is structured in four (4) parts. The first part covers photography, light, and how it all comes together to make an exposure. The second part covers the actual Canon Speedlites and all the ins-and-outs of the flash units, and how to use them on and off camera. 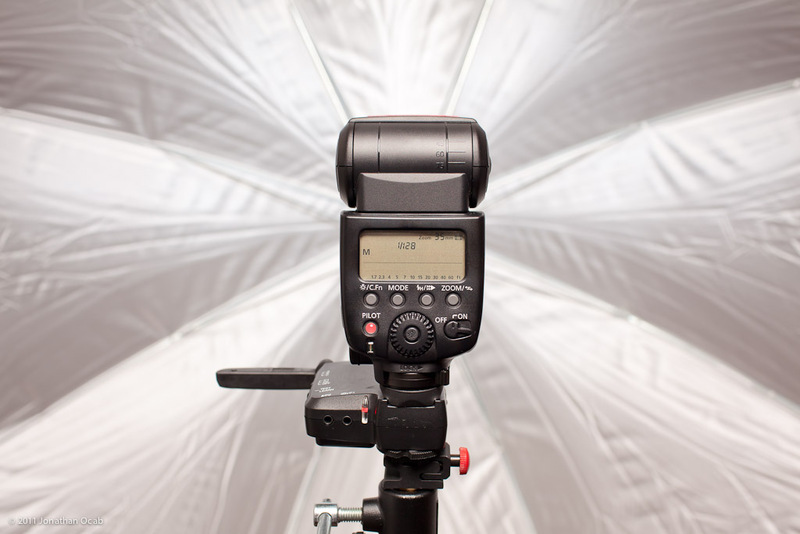 Part three covers all the various modifiers available for Canon Speedlites like softboxes, umbrellas, and the Kacey beauty dish (ocabj.net review). Part four is actual real world examples of using Speedlites with photos and lighting setup descriptions. The layout of the book is sound. The book starts from the ground up, making sure the reader understands basics like proper exposure (ISO + aperture + shutter speed) and ambient vs artificial light (continuous vs flash/strobe), and color temperature. Continuing on it gets the reader familiarized with Canon Speedlite hardware (e.g. 580 EX II, 430 EX II, ST-E2) and how to get them off the camera and modified, and ending with real world use examples. That said, more advanced photographers will probably skim through the first two parts fairly quickly and spend the majority of the time reading the “Gear for Speedliting” and “Speedliting in Action” sections, as I did. Some of the “Gear for Speedliting” content is actually available on Syl Arena’s speedliting.com website, but a good majority of it appears to be new content. The “Speedliting in Action” section is a series of photographs taken using Speedlites, with an analysis (including diagrams) of how the shot was hashed out. A good section to get inspire the reader to try different lighting styles. The book is a very easy read and it is paced well. The breakdown of what constitutes an exposure and the analysis of Canon Speedlites is a solid primer for novice photographers getting a grasp on flash photography. I highly recommend this book for any Canon shooter starting out with Speedlites or other ‘small’ flashes, and this is likely to be a majority of Canon dSLR owners since buying a Speedlite is one of the most common camera accessories purchased. Advanced photographers obviously won’t get as much out of this book as less experienced photographers will. But the latter half of the book with information on Speedlite modifiers and the real world example photographs (with analysis) is informative to say the least. It’ll give photographers used to studio strobes an idea of what kind of light can be achieved with the more portable Speedlites. On a more personal note, I wish this book had been published last year when I started to get into off-camera flash photography. I think this book would have helped me out a great deal as far as getting me acquainted with flash photography with Speedlites. Granted, I was able to get to where I am now through the various online resources (e.g. the Strobist blog, working with other photographers in the area). But this book does an excellent job compiling all aspects of Speedliting. Canon shooters should definitely consider picking up a copy the next time they’re out at their local bookstore or shopping online (e.g. Amazon). I saw this on Amazon last week… Thanks for the review, it might be a handy book to get.